The IT as a service for the employee experience. 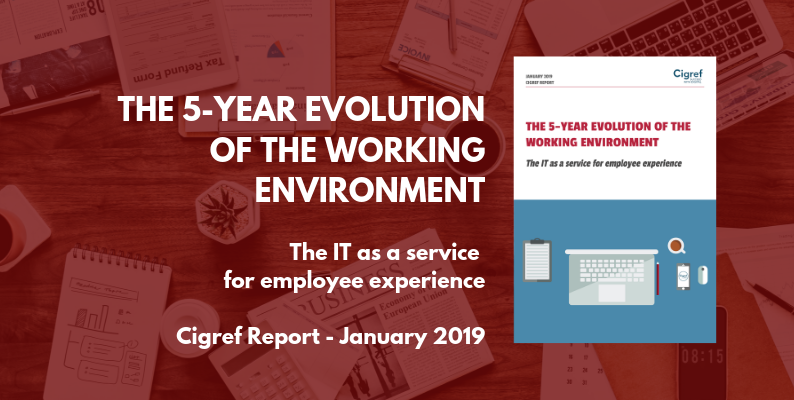 In early 2018, Cigref launched a study on the changes to organisations, digital tools and management methods that could take place in employees’ work environments in the next five years. Thirty public and private member organisations took part in this exercise as part of a working group led by Cigref and steered by the Orange Group IT Division. Why is there so much interest from IT divisions for a human resources issue? Because as a support division, IT has all of the other divisions and employees within its organisation as clients. IT brings and manages the company’s digital shared and individual tools and services and is a top-line contributor to the company’s business transformation. As such, it must adapt to employees’ new expectations while reconciling management’s constraints and objectives. In other words, the IT division must manage the company’s overall balances while offering employees a smooth and easy experience that matches their lifestyle outside the professional world. From the organisation’s point of view, they expect IT teams to participate in implementing the overall strategic vision, to deploy secure tools that improve agility and collaboration between employees and with partners. And all this with a limited budget and the weight of legacy IT. Employees, for their part, want ease of use, user friendliness, speed, and utility. They look for the value that digital tools and services can bring their business every day. Not taking the client’s needs into account can result in workarounds and a loss of control over the tools, which is not compatible with the organisation’s requirements in terms of security, privacy, and personal data protection, for which the IT division is responsible. In the fight for talent, IT divisions must tackle many irritants to improve performance and attractiveness: low-performance laptops (slow boots, for example), multiple tools, a broken user experience outside the office, deferred processing, and misunderstood processes. User experience (UX): put the in-house client at the core to create value for employees and the organisation (symmetry of expectations). Security: protect data (include employee data) and systems in an environment where remote work is growing, personal devices are increasingly used for business purposes – and vice versa – and a progressive transition to cloud-based solutions. Attractiveness: energise the employer brand, attract and retain talent, combine new generations’ expectations and behaviour with organisations’ constraints by offering tools and services that make UX more smooth and intuitive “like at home”. Anticipation of business needs, entropy and obsolescence: looking ahead while managing existing elements (“legacy” IT), making choices in a changing, uncertain environment, particularly when it comes to market solutions and transitioning to the cloud. Streamlining: identifying needs and segmenting the related audiences and behaviour (profiling), managing bi-modal IT, being able to “kill” applications, simplifying solutions, thinking in user “journeys”. Inclusive transformation: bringing along all employees, getting users to participate, managing change, relying on management and ambassadors. Methodology: Undertaking projects to modernise services and behaviour, relying on strong sponsorship, putting in place a collegial, global steering mechanism, and sharing the vision. Independence and adaptability: making sure that the chosen solutions are reversible, interoperable and well-integrated into the company’s information systems and usages as part of an approach to continuous improvement. Optimisation: Looking at investments in the work environment from a business angle, taking into account all costs (acquisition, retention and support, etc. as well as the indirect and human costs of adoption). Reconciliation: manage double binds (user expectations vs. security, compliance, and budgetary obligations), find the right balance between two competing philosophies: a monolithic model (standardising tools, imposing, prohibiting) vs a “permissive” model (controlled profusion of tools particularly by allowing personal devices). Evaluation: Measuring ROI, avoided costs, impacts on employer brand image, overall performance, user satisfaction, etc., communicating results. I hope that the lessons in this report alongside the great amount of feedback from participants’ experiences will help readers to reflect or develop their own projects to change their working environments. For companies, the human aspect (1) and the method (2) are the two factors that determine whether a work environment’s digital transformation will be a success. Since this transformation is a part of long-term, widescale projects, the return on investment (3) must also take into account the indirect and intangible benefits of the approach. Find a balance: technology is here to serve a comprehensive project to digitise the workplace, in terms of organisation, management and technology. Consider the need for support. Measure user satisfaction. Be aware of relationship symmetry. Rely on strong sponsorship from the company. Have management drive the changes. Be agile and able to change solutions and spaces according to behaviours. Opt for a simple, global, integrated approach – notable when choosing application tools. Consequently, take a Darwinian approach: known when to kill or decommission applications to keep it simple. Think in terms of the “lowest common denominator” in a large corporation. Account for diversity, “exclude” segments of the population with very specific needs, and define personas. On the other hand, avoid the trap of multiplicity (creating too many profiles becomes unmanageable). Look at profitability from several angles: costs avoided, money saved, as well as the benefits to image (the attractiveness of the employer brand), well-being, and productivity. Do not underestimate the financial and human investment or the time scale. Define indicators (user satisfaction, time connected, etc. ).